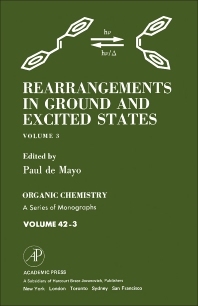 Rearrangements in Ground and Excited States, Volume 3 presents essays on the chemical generation of excited states; the cis-trans isomerization of olefins; and the photochemical rearrangements in trienes. The book also includes essays on the zimmerman rearrangements; the photochemical rearrangements of enones; the photochemical rearrangements of conjugated cyclic dienones; and the rearrangements of the benzene ring. Essays on the photo rearrangements via biradicals of simple carbonyl compounds; the photochemical rearrangements involving three-membered rings or five-membered ring heterocycles; and the photochemical rearrangements of coordination compounds are also covered. Chemists and people involved in the study of the rearrangements in ground and excited states will find the book invaluable.